Time-slot tickets for the Eiffel Tower are almost essential and a good deal to see the Louvre Museum. 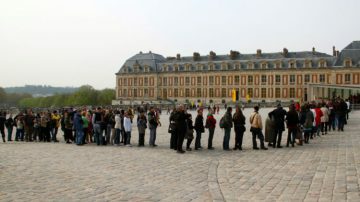 Guided tours cut the lines at the Palace of Versailles. 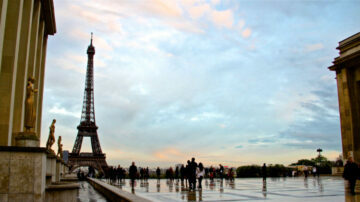 The Eiffel Tower in Paris is best seen on advance purchase tickets with time-slot reservations. Lines are often endless with no guarantee of ascending the tower without skip-the-line tickets. Time-slot reservations tickets for the Louvre Museum also allow visitors priority entrance to shorten the wait in the notoriously long security checkpoint lines. 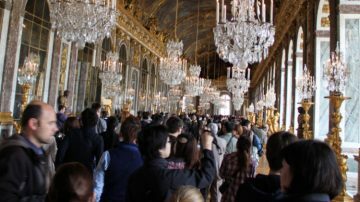 At the Palace of Versailles, guided tours are the quickest way to enter the palace on busy days (although time-slot admissions may be introduced soon). For these prime sites, the best times to visit are first thing in the morning or late afternoon (but after 20:00 for the Eiffel Tower). The Eiffel Tower remains a hugely popular site to visit in Paris with queues at the bottom of the tower often mind-numbingly long. Tickets to go up the Eiffel Tower by elevator – either to the second floor or the summit – are best bought online well in advance directly from the Eiffel Tower site itself. On days when online tickets are no longer available, several further options are possible. Some tickets are still sold on-site, especially the cheaper stairs rather than elevator option that is only available at the tower itself. Many guided tours include the Eiffel Tower – the cheapest option is nothing more than a walk through to the elevator (or up the stairs) but combining the Eiffel Tower with a Seine cruise or full day Paris-Versailles tour may be better value for money. It is also possible to skip-the-line at the Eiffel Tower with a restaurant reservation for one of the better restaurants in the tower – Jules Verne (due to reopen early 2019) on the second level for posh food or Restaurant 58 on the first level for much more reasonable prices with lunch significantly cheaper than dinner (but access to higher levels is not included). See Eiffel Tower Advance Online Ticket Reservations for more details and options. Although advance purchase skip-the-line tickets for the Louvre Museum in Paris is not yet obligatory, anyone visiting the Louvre without time-slot tickets are likely to spend a lot of time waiting in the security line regretting not planning a bit in advance. The Louvre recently introduced actual time-slot tickets too and these are well worth the small surcharge. Rather infuriating, these tickets need to be printed on paper. Resellers such as Tiqets and GetYourGuide sell show-on-phone tickets but at a higher price. 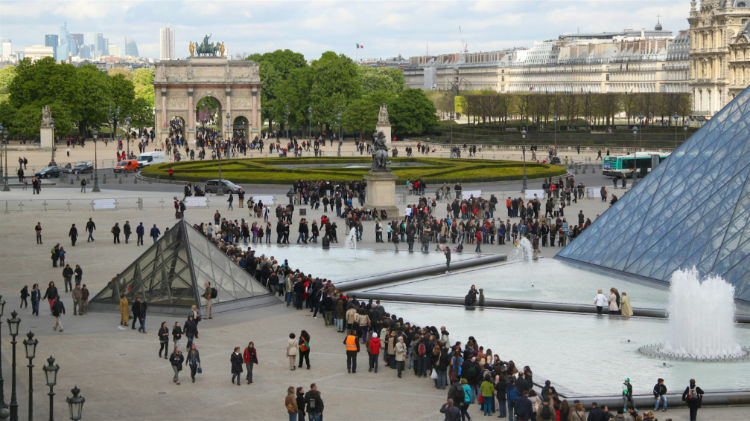 Admission to the security queues at the Louvre is currently in the following order: time-slot tickets, other tickets (including the Paris Museum Pass) and lastly visitors without tickets (or free access). Guided tours are also a good option for fast admission and visitors may stay inside the museum at the end of the tour if desired. On very busy days, late afternoon guided tours are also a pleasant way to see the museum, as it empties rather than getting progressively fuller as with early morning tours. 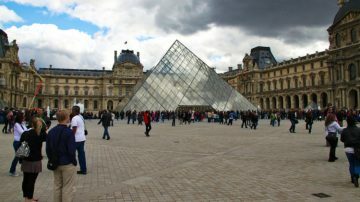 See Tips on Buying Skip-the-Line Tickets and Guided Tours for the Louvre Museum for more information. The Palace of Versailles is the most-popular daytrip destination from Paris. Many, if not most, visitors arrive with tickets pre-arranged and advance skip-the-line tickets are worth having. However, these are not skip-the-security-line tickets, which can be very long and slow moving. During the 2018 year-end holidays, the Chateau de Versailles introduced tickets with time-slot admissions – this will hopefully become a permanent feature, as waiting times should be cut to maximum half an hour. Visitors with time-slot tickets may use the central door at the Dufour Pavilion. For the time being, Versailles time-slot tickets have no surcharge and visitors qualifying for free admission may also make free online time-slot reservations. Without time-slot tickets, the Palace if Versailles is one sight where a guided tour is a very good option even for travelers generally preferring to go it alone. Guided tours use separate entrances, which saves a lot of time on busy days and some rooms are seen that are not open to individual visitors. The palace itself is still likely to be unpleasantly crowded inside but at least visitors may skip the long queue to get in. Guided tours with transportation from central Paris are common. However, it is also easy to abandon the tour in Versailles and spend more time in the gardens and return by train – it is simple and very cheap. See also Visiting the Château de Versailles for more information. Purchasing tickets online for major tourist sites in Europe save time. Even better are time-slot reservations, whether essential as at sites such as the Sagrada Familia in Barcelona or The Last Supper in Milan or optional as for the Louvre and Vatican Museum. The Anne Frank Huis and Van Gogh Museum in Amsterdam only sell tickets online with no option to buy at the museum itself.